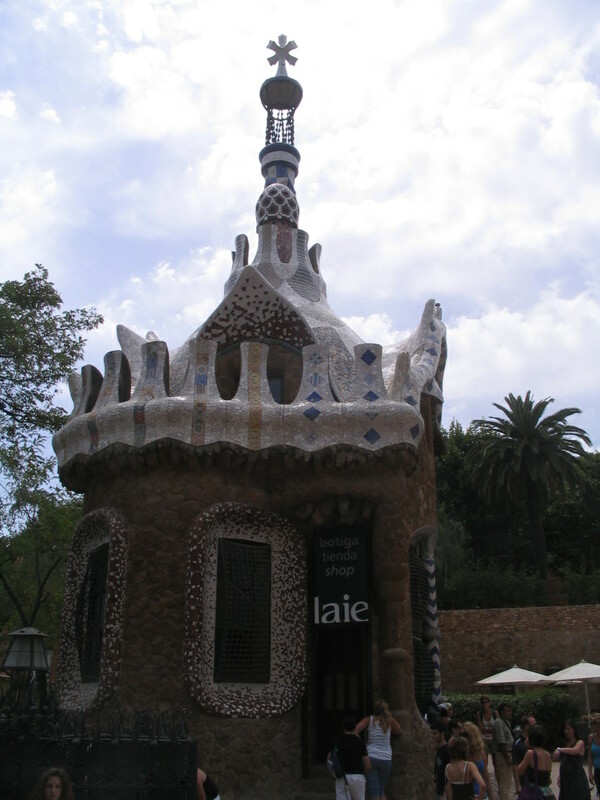 Park Güell 3: The Güellening. 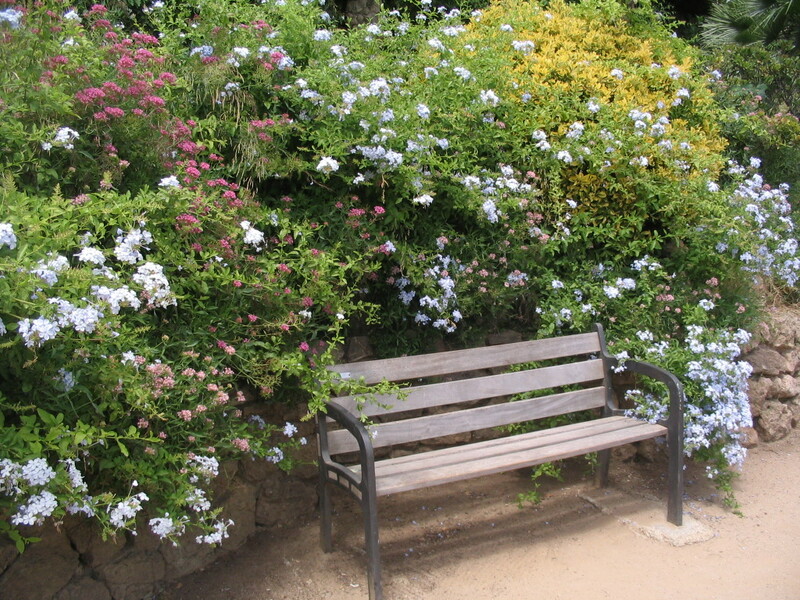 A plain bench, but prettily framed. 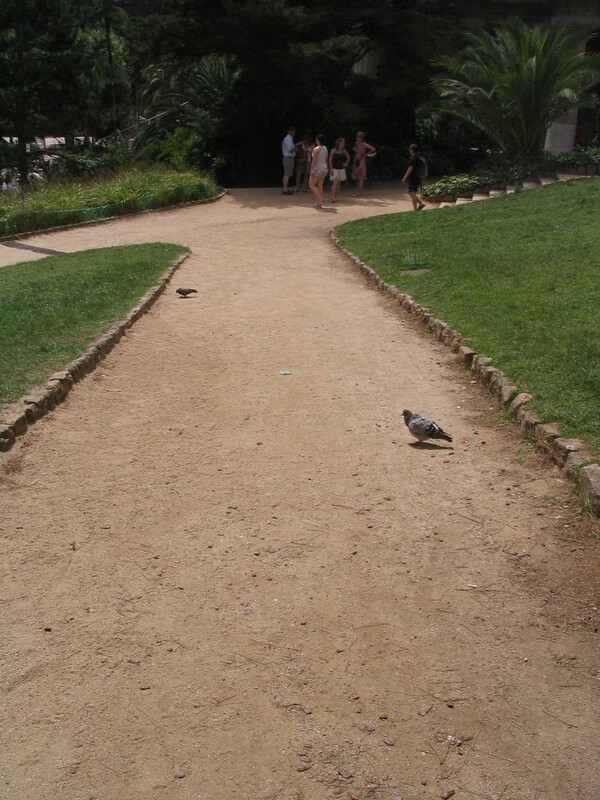 To the east of the Plaça de la Natura is a sloping lawn with paths zigzagging down it, and pigeons. 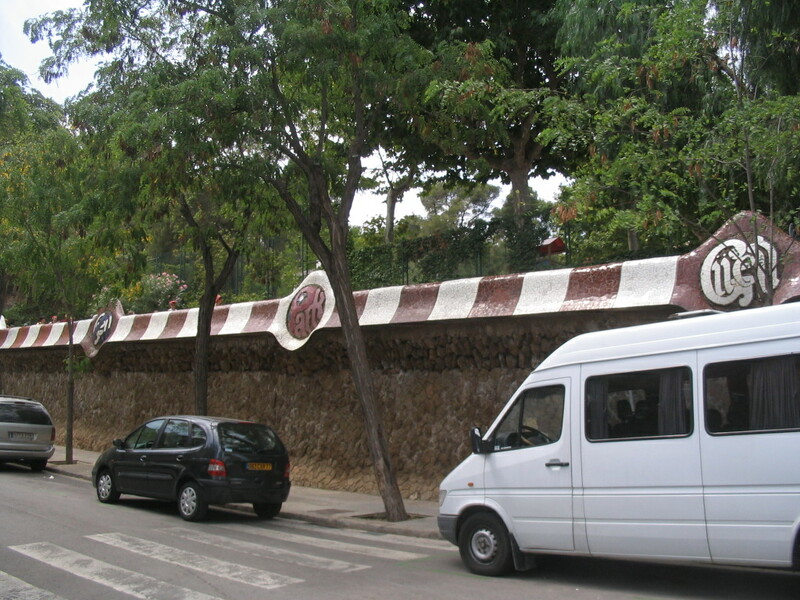 So what is it that's underneath the Plaça? 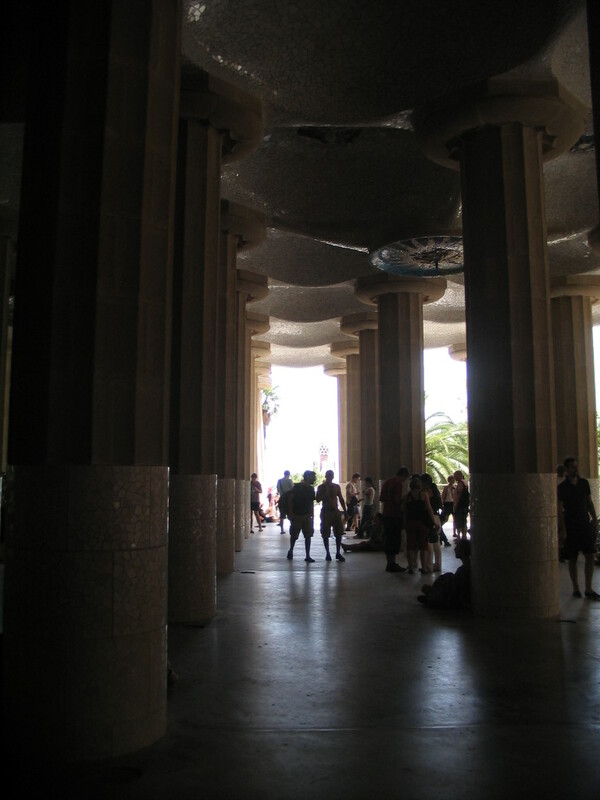 It's the Sala Hipòstila (the Hypostyle Room), a space filled with dozens of grand columns. Small domed vaults span the space between the columns. 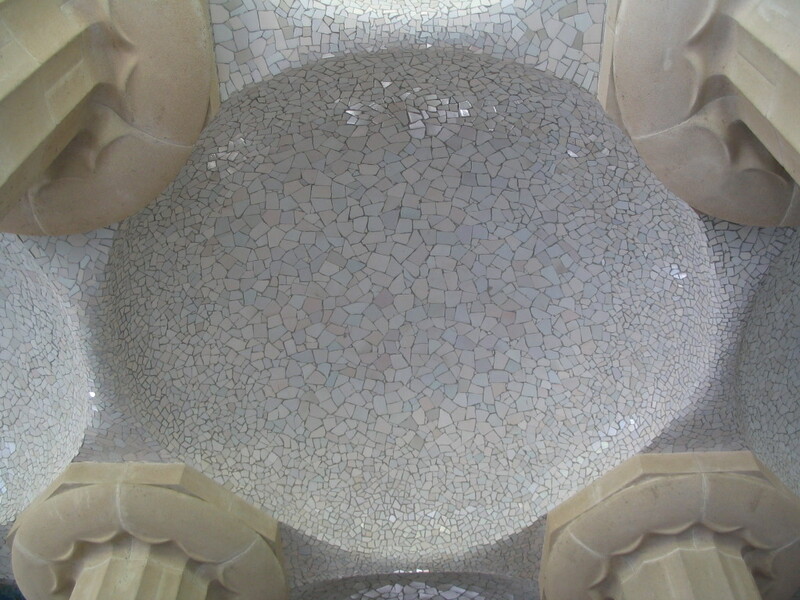 Note the size gradient of the shards from the edge to the center of the dome. 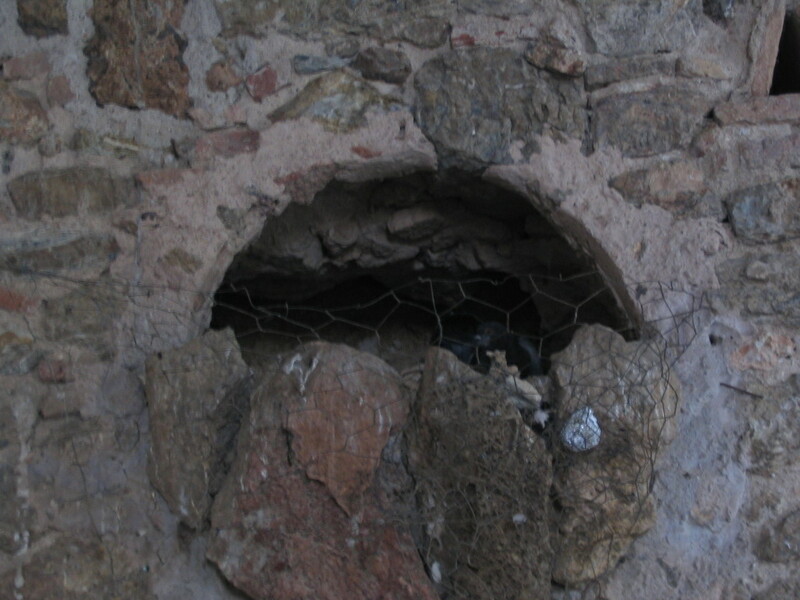 The back wall of the Sala contains niches that the pigeons are all about nesting in. A wider view of the Sala. 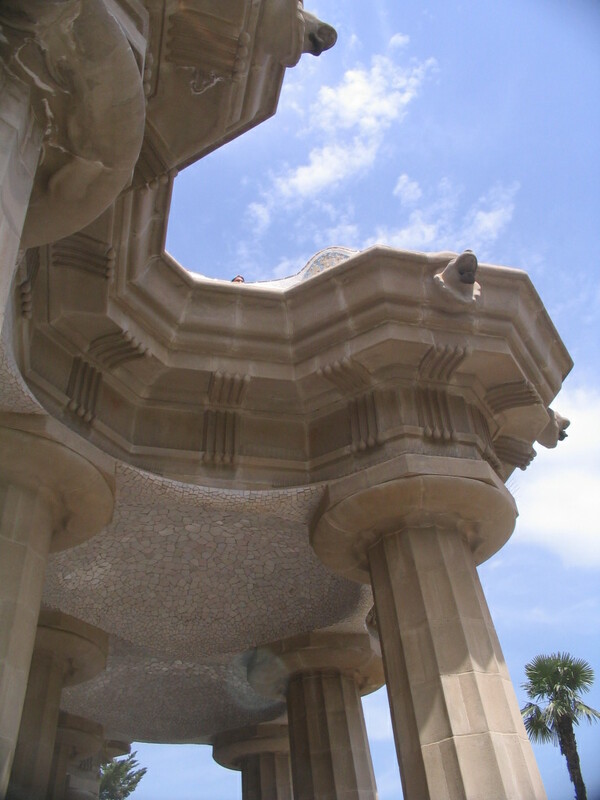 The front edge of the Sala, with the serpent bench of the Plaça just visible above. 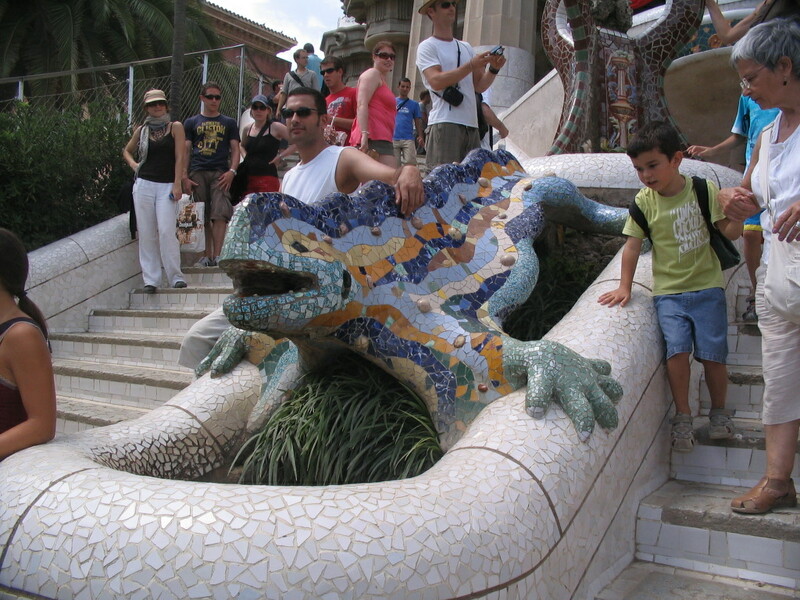 In the middle of the front stairs down from the Sala Hipòstila is the delightful, ever-enthused El Drac (The Dragon), actually a salamander. Everyone wants a photo with him. 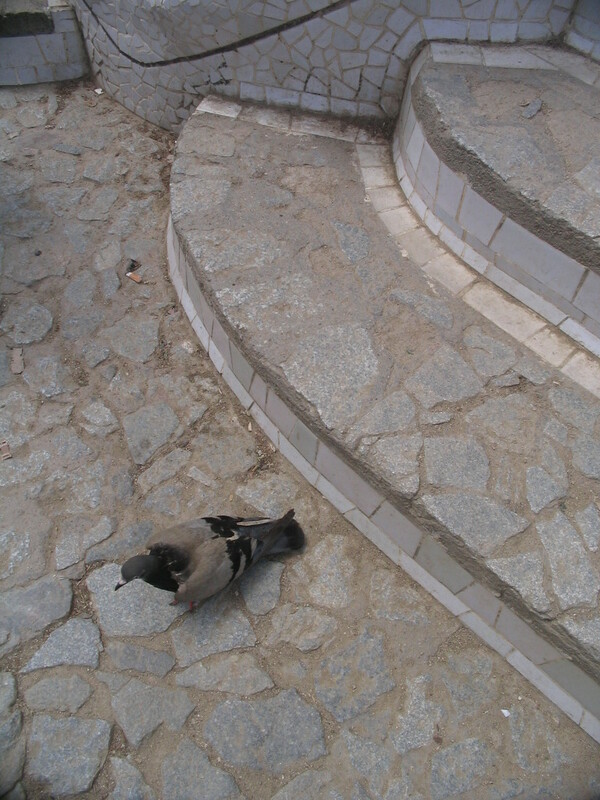 This pigeon is dangerously close to being underfoot. 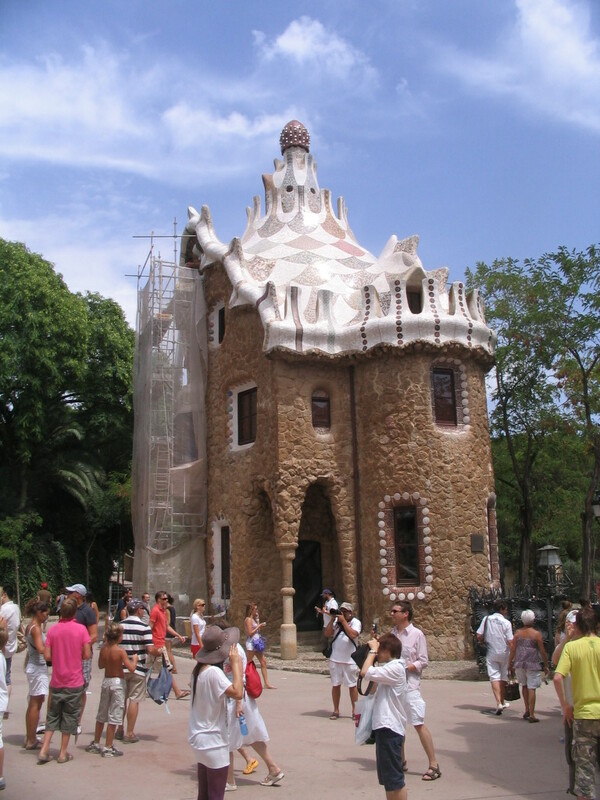 The front entrance to the Park is flanked by two pavilions designed, unmistakably, by Gaudí, of which this is the northeastern one. 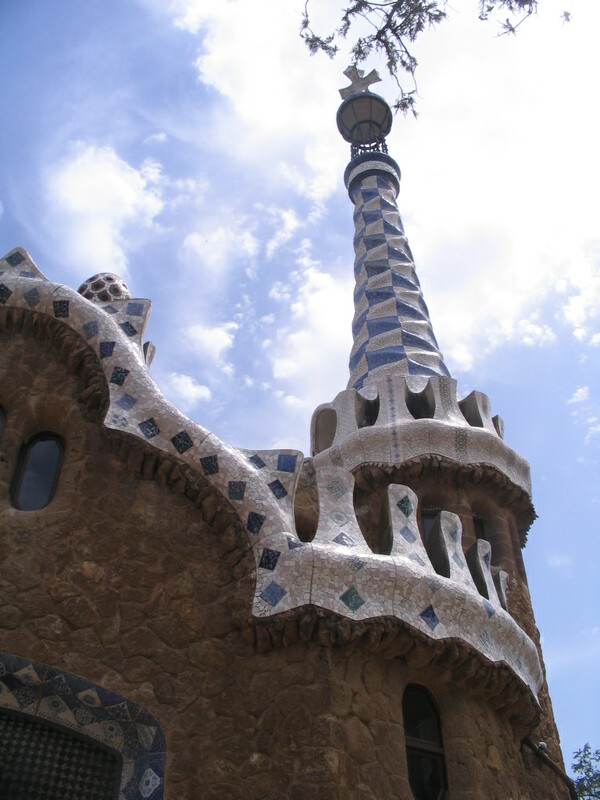 The southwestern pavilion has a rather aquatic spire. A full view of the diminutive southwestern pavilion. 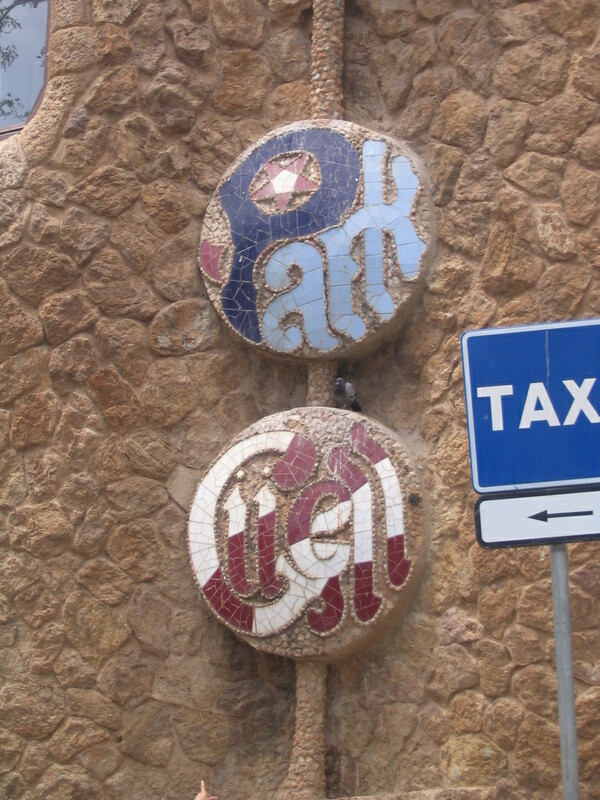 The entrance to the Park is clearly texturally delineated. Here it is: the grand entrance view, complete with madding crowd, looking all the way back up to the front edge of the Plaça de la Natura. 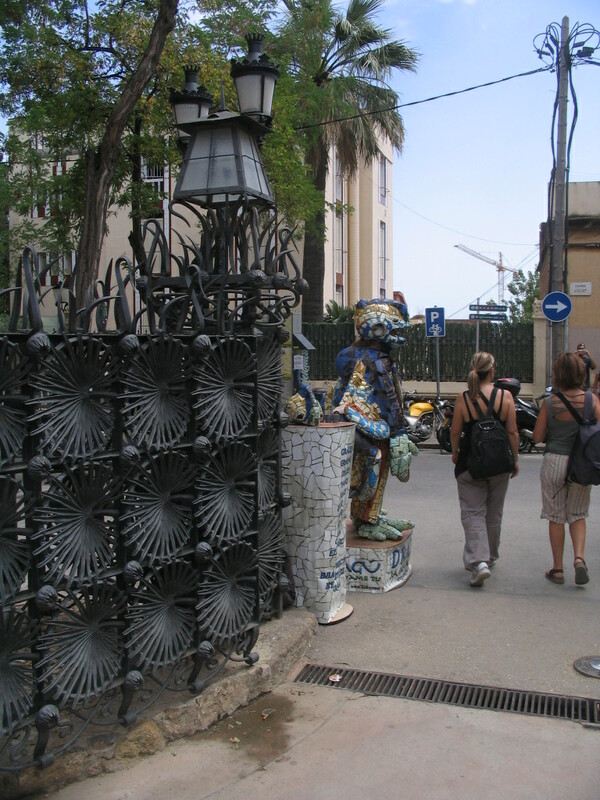 Fanciful Park Güell medallions on the front wall of the southwestern pavilion, facing Carrer d'Olot, with a pidge for scale. 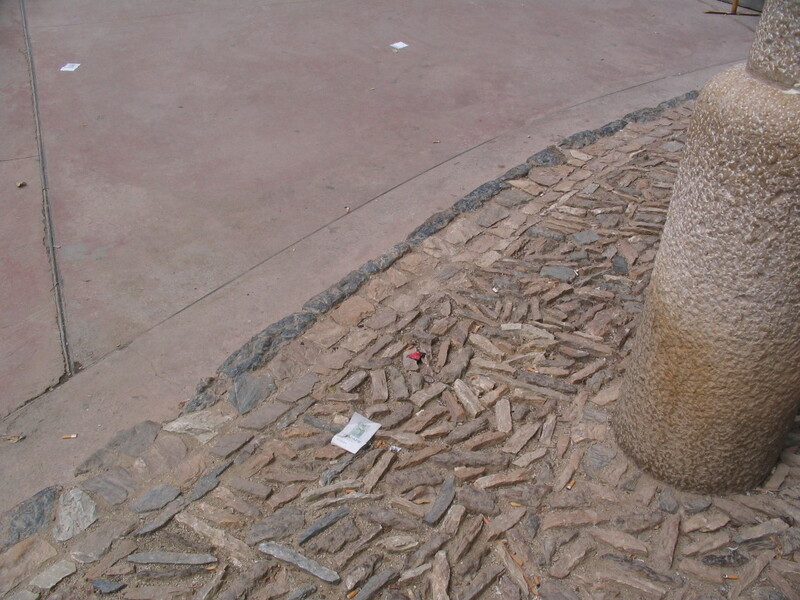 The outer wall is quite helpful for wayfinding. 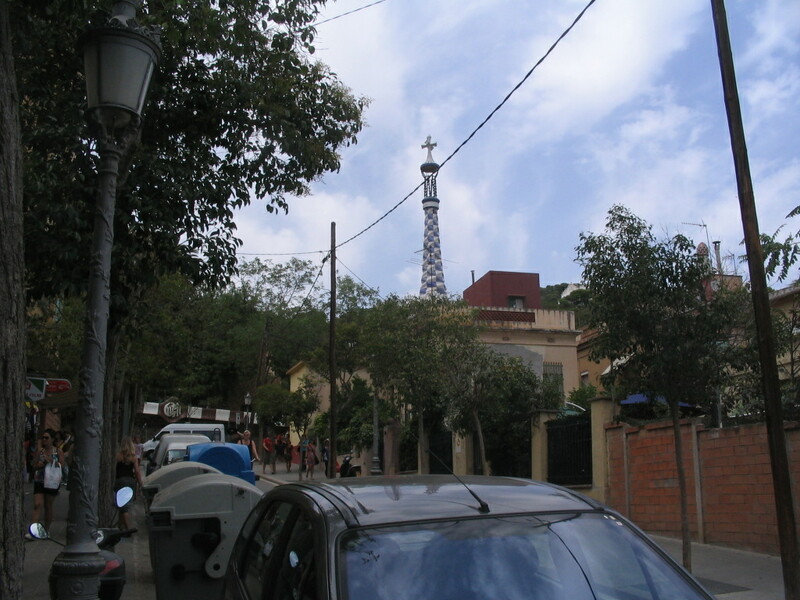 A last glimpse of the pavilion tower from Carrer de Larrard. 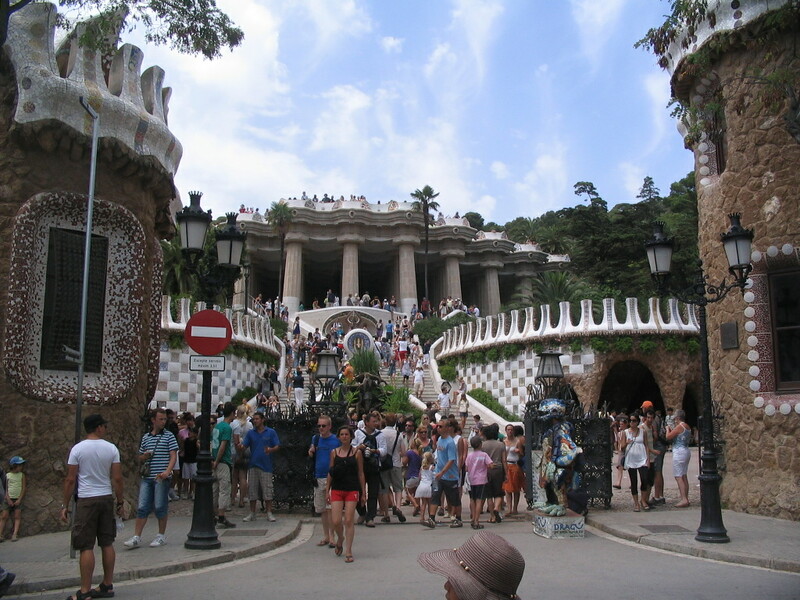 So long, Park Güell.